For the town within the metropolitan borough, see Rotherham. For the council which governs this borough, see Rotherham Metropolitan Borough Council. For the local government district in East Sussex, see Rother District. The Metropolitan Borough of Rotherham is a metropolitan borough of South Yorkshire, England. It is named after its largest town, Rotherham, but also spans the outlying towns of Maltby, Rawmarsh, Swinton, Wath-upon-Dearne, and also Dinnington and Laughton as well as a suburban and rural element composed of hills, escarpments and broad valleys. The district was formed on 1 April 1974, under the Local Government Act 1972, as a merger of the County Borough of Rotherham, with Maltby, Rawmarsh, Swinton and Wath-upon-Dearne urban districts along with Rotherham Rural District and Kiveton Park Rural District. Rotherham Metropolitan Borough Council is one of the safest Labour councils in the United Kingdom, although the number of Labour council seats dropped from 92% to 79% in 2014 following the Rotherham child sexual exploitation scandal. 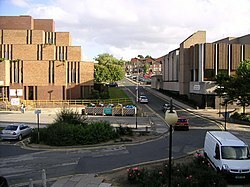 The Metropolitan Borough of Rotherham was founded in 1974, and Labour have been in control of the council since the first election. ^ "R2011 Census: KS201EW Ethnic group, local authorities in England and Wales". National Statistics Online. Office for National Statistics. Retrieved 21 February 2015. ^ a b "Election Results 2008, Rotherham council". BBC News. 19 April 2008. Retrieved 12 May 2010.